3/18: Science Time With Slime Pt 1– New York Student Ambassador Caroline Pope held her first workshop on slime for 2nd-3rd grade girls! 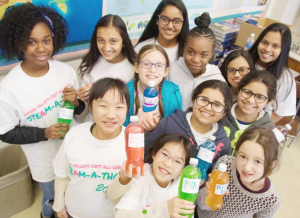 3/21: Science Time With Slime Pt 2– New York Student Ambassador Caroline Pope held her second workshop on slime for 4th-5th grade girls! 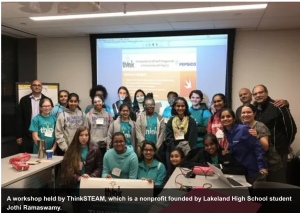 3/23: STEAM-A-THON–Sponsored by HERlead, ThinkSTEAM held Hudson Valley’s All – Girls STEAM-A-THON, with four different STEM workshops for 75 girls throughout the tri-state area! 2/2: Slime Time– Ohio Student Ambassador Akhila Boda held her first workshop on slime for elementary school girls! 2/14: Hands On Science Workshop– Michigan Student Ambassador Aditi Locula held her first workshop on hands on science for elementary school girls! 12/1: Hands On Science Workshop– Girls got to learn about basic science and engineering concepts through fun experiments like creating bath bombs to take home! 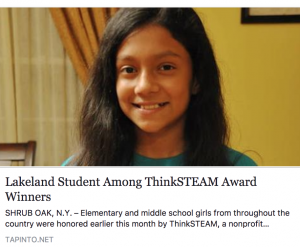 12/19: ThinkSTEAM’s Student Ambassador Grant Program Announced– This year, ThinkSTEAM will be sponsoring grants for each of its Student Ambassadors! 11/15: STEAM-A-THON Grant Approved – The STEAM-A-THON is officially set to happen in March 2019–Stay Tuned! 10/11: 2018-2019 Student Ambassador Season Kicked Off! 9/15: ThinkBIG Challenge Results Announced! 9/29: Neurology Workshop– Girls got to learn about neurology at Student Ambassador Sofia Melnychuck’s workshop on neurology in Arizona! 8/11: Hands On Science Workshop– Led by Student Ambassador Shrudhii Kundu, girls got to learn about basic science and engineering concepts through building truss bridges, lava lamps, and even slime! 8/18: Swift Playgrounds Workshop 2 Pepsico HQ in Purchase, NY– Girls got to learn about building an animation with their name in Swift Playgrounds, film a video in PepsiCo’s Broadcast Studio, tour around the PepsiCo HQ, and see some of the sculptures in the Sculpture Garden! 7/18: Workshop with Peekskill Youth Bureau – Led by Student Lead Alliyah Steele, girls got to learn how to make light up brains made out of electricity conducting Play-Do. 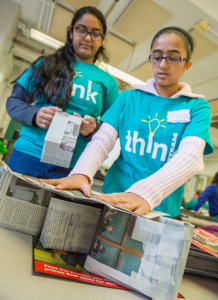 5/19: Make Your Own Wearables Workshop at IBM’s TJ Watson Research Center – Girls got to create light up hats with the Arduino Gemma and meet IBM’s Watson, the robot that won Jeopardy against the world champions at IBM’s TJ Watson Research Center. 5/31:ThinkSTEAM’s Paper Circuits Workshop for Girl Scouts at Ben Franklin Elementary School – The Girl Scouts loved learning about the world of electricity and circuits and making a light up cupcake card at ThinkSTEAM’s paper circuits workshop! 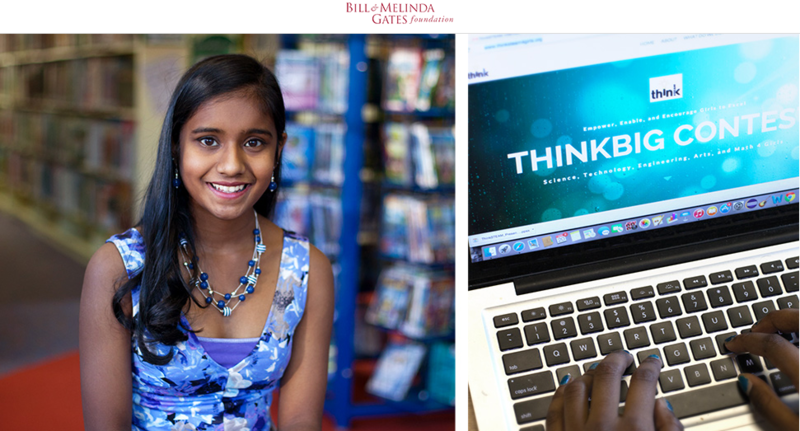 4/28: Build an App With App Inventor – Student Lead Smriti Somasundaram led an App Inventor Workshop at Tumwater Timberland Library for middle school girls. 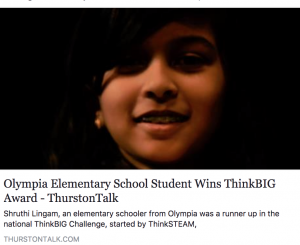 3/1: Third Annual ThinkBIG Challenge Opens to a Global Stage! 3/17:WESEF – ThinkSTEAM awards were given to sophomore and junior girls at the WESEF competition in Sleepy Hollow High School in NY. 3/25: Paper Circuits Workshop – Student Lead Shrudhii Kundu led a Paper Circuits Workshop at Barnes & Noble for elementary school girls. 2/3: Code Matters Part III – Sponsored by AspireIT, ThinkSTEAM partnered with Columbia SWE in the final week of our three part workshop series, in which girls were challenged to use what they learned to create an app/website raising awareness of any social issue. 2/19: Workshop Visit to SynCardia – A Leader in the Total Artificial Heart – Our first workshop held in Arizona led by Student Chapter Lead Sofia Melnychuck in partnership with SynCardia. 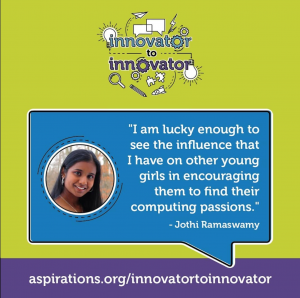 1/20: Code Matters Part II – Sponsored by AspireIT, ThinkSTEAM partnered with Columbia SWE in the second week of our three part workshop series, in which girls learned how to build apps using App Inventor. 1/23: Code Matters Part I – Sponsored by AspireIT, ThinkSTEAM partnered with Columbia SWE in the first week of our three part workshop series, in which girls learned how to build websites using HTML. 11/7: Swift Playgrounds Workshop 2 Pepsico HQ in Purchase, NY– Girls got to learn about building an animation with their name in Swift Playgrounds, film a video in PepsiCo’s Broadcast Studio, tour around the PepsiCo HQ, and see some of the sculptures in the Sculpture Garden! 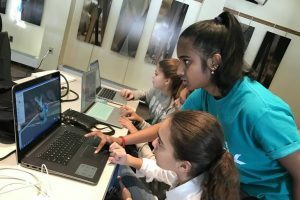 8/4: Introduction to App Inventor– Girls enjoyed learning how to create a simple app with App Inventor at our Introduction to App Inventor Workshop at Accenture NYC, which also included a tour of the office, and speakers from Accenture as well! 8/20: Synthetic Biology Workshop with Columbia University’s iGEM Team – Our Synthetic Biology workshop with Columbia’s iGEM team was a great success! The girls loved going into the labs and seeing all the hands on demonstrations! 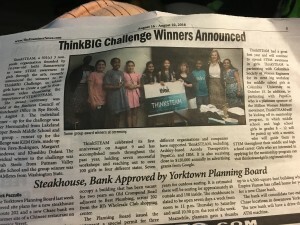 7/26: ThinkBIG Challenge Closed– The second annual ThinkBIG Challenge wrapped up, with entries from elementary and middle school girls across the nation! 6/17: Make Your Own Electrical Ornaments Light Up– IBM and SWE New York Section E in collaboration with ThinkSTEAM hosted a workshop at IBM’s T.J.Watson Research Center. 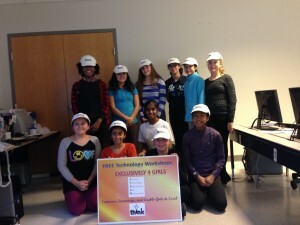 15 girls from various middle schools from New York and Connecticut attended the workshop.The girls got to see Watson, the robot that won Jeopardy, and had an exclusive tour of the ThinkLabs as well. The workshop was a grand success!! 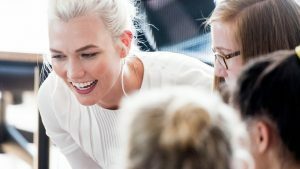 5/26: Tours and Demos at Google– Girls enjoyed touring around Google’s office in New York City and learning about how the Google Home works while testing it out with demos. 3/4: WESEF – ThinkSTEAM awards were given to sophomore and junior girls at the WESEF competition in Sleepy Hollow High School in NY. 3/17: 3D Printing Workshop – Girls loved learning about how a 3D printer works at the John C. Hart Library in Shrub Oak, NY. They got to see a 3D printer in action take home 3D printed bracelets! 3/18: Hudson Valley STEM Fest – ThinkSTEAM presented at the Hudson Valley STEM Fest for middle school students, which was held at Blind Brook Middle School in Rye, NY. 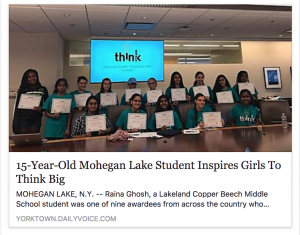 3/25: Girls Rock STEM Day – Jothi Ramaswamy, ThinkSTEAM’s founder/CEO, gave the keynote address in SUNY New Paltz and reached out to over 175 girls from 27 different school districts! 2/24: ThinkSTEAM’s Paper Circuits Workshop for Girl Scouts at George Washington Elementary School – The Girl Scouts loved learning about the world of electricity and circuits and making a light up cupcake card at ThinkSTEAM’s paper circuits workshop! 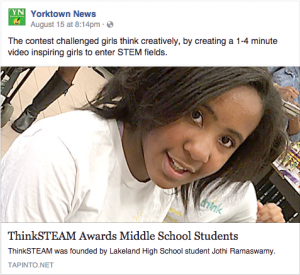 1/17: ThinkSTEAM’s ThinkBIG Challenge Opens!– Our 2017 ThinkBIG Challenge to challenge girls to create a video showing the importance of STEM opens for middle school girls and for elementary school girls this year as well. 12/29: ThinkSTEAM’s Programming in Python Workshop at Facebook, NYC– Girls enjoyed learning how to program in Python at our Programming in Python Workshop at Facebook, NYC, which also included a tour of the Facebook office! 12/11: ThinkSTEAM’s Paper Circuits Workshop at Barnes and Noble– Girls loved learning about the world of electricity and circuits at ThinkSTEAM’s paper circuits workshop at Barnes and Noble! ThinkSTEAM also held a fundraiser at Barnes & Noble in stores and online (Dec. 11-16) to help raise money for workshops and other events! 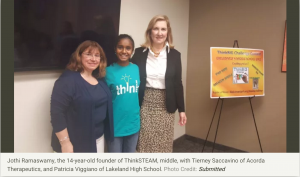 11/6: ThinkSTEAM at Barnes & Noble’s Mini Maker Faire 2016 – It was great to see ThinkSTEAM Girls showcase many of their projects and posters of science experiments at Barnes & Noble’s Mini Maker Faire in Cortlandt Manor! 11/12: ThinkSTEAM’s Engineering Workshop with Columbia’s SWE -ThinkSTEAM’s workshop with Columbia Society of Women Engineers was just amazing! Girls had a fabulous time touring the labs and doing a design challenge. They also had a lot of fun peddling their own smoothie with the smoothie bike! 10/1: Synthetic Biology Workshop with Columbia University’s iGEM Team – The Synthetic Biology Workshop with Columbia University’s iGEM Team was awesome! Girls got to tour the labs in Columbia’s Lasker Biomedical Building, see demos of different genetic techniques, and do their own hands on activities with pipetting! 8/3: ThinkBIG Challenge Award Ceremony – The ThinkBIG Challenge Award Ceremony was held at the Business Council of Westchester Office. Congratulations to all the winners! Check out our gallery for pictures from the event. 8/13: Scratch Workshop at the John C Hart Library – The Scratch workshop at the John C Hart Memorial Library for elementary school girls was a lot of fun! 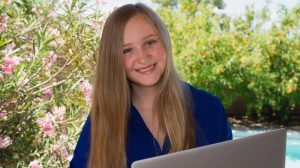 6/11: “Building a Game in a Day with Scratch” Workshop – Our first workshop for elementary school girls in Minnesota! 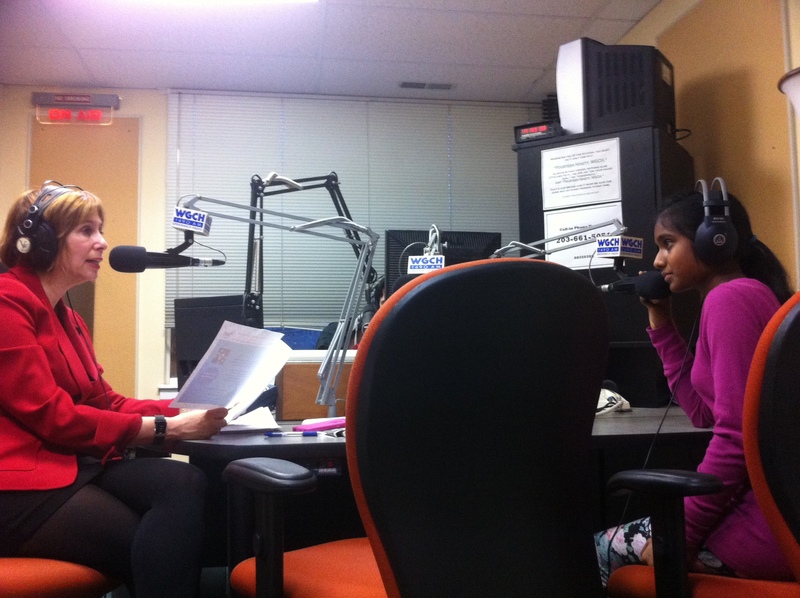 5/20: A Big Shout Out to the PepsiCo Foundation for its generous grant towards ThinkSTEAM’s initiatives!! 5/14: “Make your own Electronic Wearable Accessory” Workshop – IBM and SWE New York Section E in collaboration with ThinkSTEAM hosted a grand workshop at IBM’s T.J.Watson Research Center. 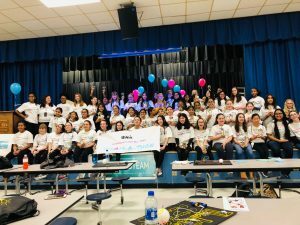 50 girls from various middle schools from New York and Connecticut attended the workshop.The girls got to see Watson, the robot that won Jeopardy, and had an exclusive tour of the ThinkLabs as well. The workshop was a grand success!! 4/17: Educator Appreciation Days – ThinkSTEAM gave live demos at Barnes & Noble of featured products including Dash, the amazing coding robot from Wonder Workshop, and a new, exclusive Barnes & Noble product from littleBits™ education. 3/5:Hudson Valley STEM Fest – ThinkSTEAM presented at the Hudson Valley STEM Fest for middle school students, which was held at the Southern Westchester BOCES Campus in Valhalla, NY. 3/12: WESEF – ThinkSTEAM presented awards at the WESEF competition in Sleepy Hollow High School in NY. 2/6: Java Workshop for Beginners – The first workshop for high school girls at the John C. Hart Library was a great success. The girls really learned a lot about object oriented programming. Thank you to the instructor, Mike D’Orazio, and other volunteers from PepsiCo for helping ThinkSTEAM with this workshop. 1/24: Lego Skyline and Architecture Studio Build Event at Barnes&Noble in Cortlandt Manor – The girls had a lot of fun building the NYC and Venice Skyline, which were both put for display at the Barnes and Nobles in Cortlandt Manor, NY. 12/13 : The 3D Printing Workshop that took place at Mahopac Public Library was awesome! Thank you to Jason Pelecanos and Ijeoma Pelecanos for making this workshop happen! Thank you to the Walmart in Cortlandt Manor, New York for providing corporate sponsorship towards ThinkSTEAM’s technology workshops! 11/15 : IBM and Society of Women Engineers helped out with ThinkSTEAM’s “Make Your Own Wearables Workshop” at Mahopac Public Library. The workshop was a grand success! 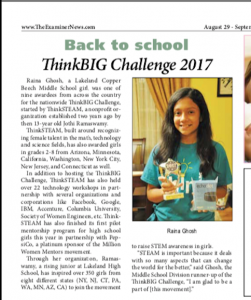 Jothi Ramaswamy, ThinkSTEAM’s Founder/CEO, presenting at Girls Rock STEM 2017!